History | Lighthouses of Australia Inc.
Lighthouses of Australia Inc was formed in 2002, and is a result of a merger between the Lighthouses of Australia Project and the Australian Lighthouse Association. The Australian Lighthouse Association (ALA) was founded in 1980 and functioned as a lobby group, campaigning for the future of lighthouses. New technology threatened the continued provision of visual navaids, and the de-manning of the Australian lighthouses appeared inevitable. The ALA mounted a vigorous campaign to highlight the importance of the lights to fishermen and recreational sailors, and draw attention to the dangers of neglect and vandalism to these priceless heritage assets. Lobbying by the ALA led to the establishment of a Commonwealth Parliamentary Committee that produced a report “Who will keep the Keepers”, which recommended an orderly process for the removal of traditional keepers from our lights as they were automated, and measures to ensure that vulnerable locations be not left un-manned. Sadly, the ALA fought a losing battle to keep the keepers on the lights. 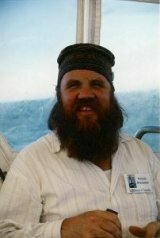 The Lighthouses of Australia Project (LoAP) was founded by Malcolm Macdonald in 1997, to represent and promote Australian lighthouses on the Internet and provide a central resource of Internet links to other Australian lighthouse websites. A monthly emailed bulletin was developed to advise supporters of new pages on the site, to acknowledge those who had contributed, and to keep enthusiasts informed of news and reports concerning historic Australian lighthouses. In early 2001, LoAP was established as an incorporated body to allow other interested people to assist the Project in a formal way, and was renamed Lighthouses of Australia Inc (LoA Inc). The ALA recognised the vitality of the young organisation (LoA Inc), and it was decided to bring the two organisations together to effectively carry the baton. In early 2002, the ALA disbanded and transferred to LoA Inc. The ALA logo motto was combined with the adoption of LoA Inc’s masthead lighthouse to produce a dynamic new logo, and with the adoption of the ALA motto, “Preserve, Protect, Promote”, it created a broader sense of direction for LoA Inc. The merger gave LoA Inc, a largely Internet-based organisation, an opportunity to ground itself and accommodate many of the original ALA members who did not have Internet access, by agreeing to take over the ALA’s hardcopy newsletter, Prism. Prism was redesigned by its new editor, Denise Shultz, and is published bi-monthly in an informative and easy-to-read format. Lighthouses of Australia Inc aims to create a higher profile for Australian lighthouses within Australia and overseas and thereby preserve, protect and promote their place within our history.